Are you ready for lip-smackin’ sinful delights? 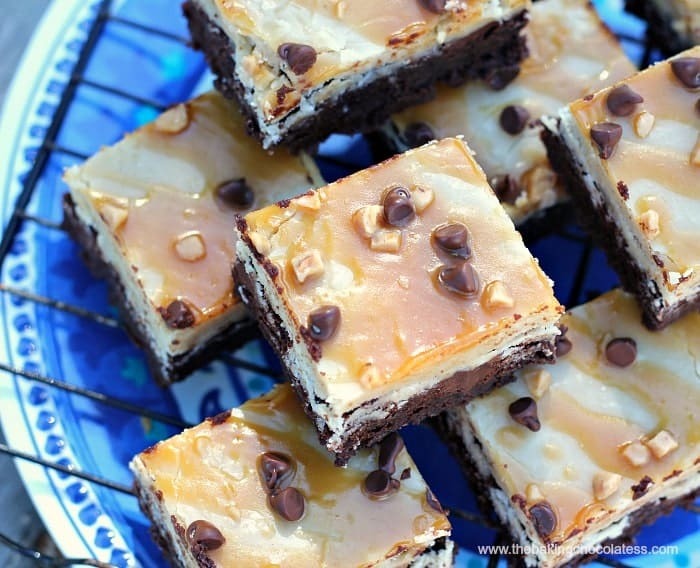 These Best Caramel-icious Frosted Brownies need to go to confession. Seriously. You. Have. To. Go. There. 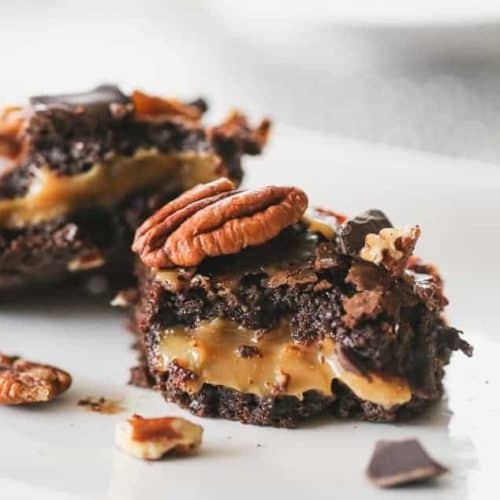 So chewy, so fudgy, these double chocolate (cocoa and chocolate chip ) brownies are topped off with a to-die-for luscious, sweet rich Caramel Frosting, then a drizzle or 15 of salted caramel sauce, a sprinkle of buttery toffee bits and a sprinkle of mini chocolate chips… and there you have killer freakin’ brownies. It’s understood! And deliciously, sinfully biteful! Preheat the oven to 325 degrees Fahrenheit with a rack in the lower third of the oven. Melt the butter in a medium-sized saucepan over medium heat, whisking constantly, until it’s a pale golden brown and the particles suspended in it are reddish brown approx. 10 minutes. Remove pan from heat and stir in the sugar. Add the cocoa powder, sea salt and baking powder and stir until the ingredients are thoroughly incorporated. Let the mixture cool for 5 minutes. Add the eggs one at a time whisking until incorporated well. When the mixture looks thick and shiny, add the vanilla extract and the flour. Stir until you no longer see streaks of flour, then beat vigorously for 50 strokes with the wooden spoon or spatula. Once the brownies are completely cool, lift the edges of the parchment paper and transfer the brownies to a cutting board. In a saucepan over medium heat, melt the butter, and mix in cream and brown sugar. Boil vigorously for 1 minute. Remove from heat, and beat in 1/2 cup confectioners' sugar. Cool slightly, and beat in the vanilla and remaining 1/2 cup confectioners' sugar. Add more cream if the mixture is too thick. 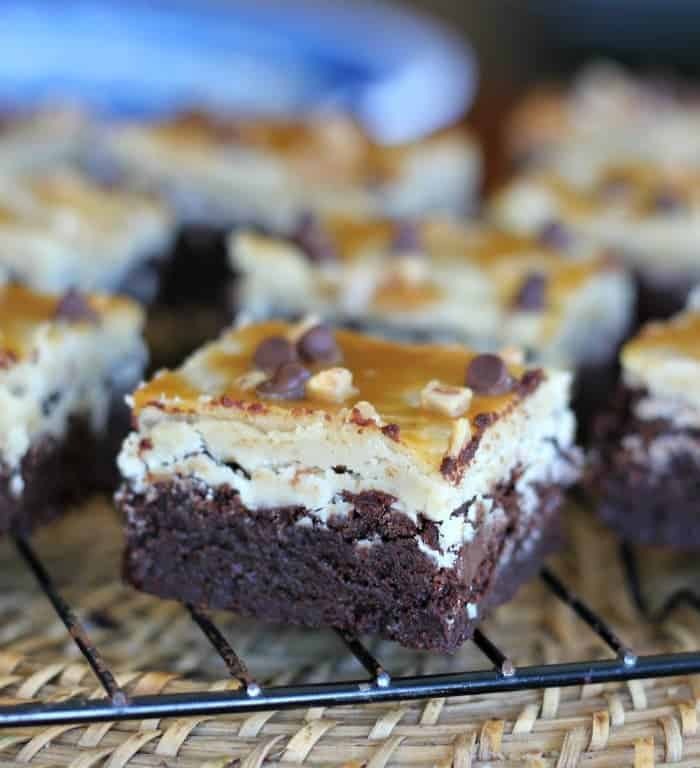 Pour and frost brownies fast, frosting will thicken up and be hard to spread. 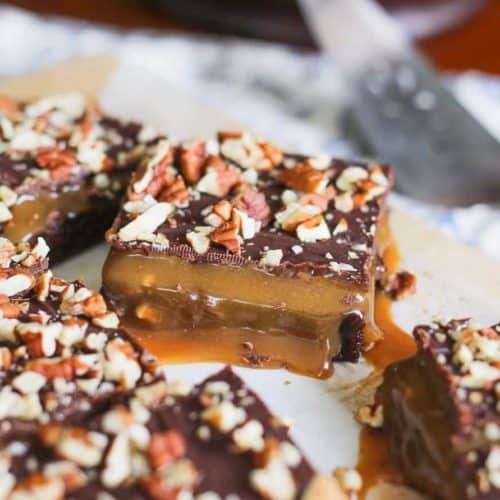 Add some salted caramel sauce, toffee chips and mini chocolate chips. 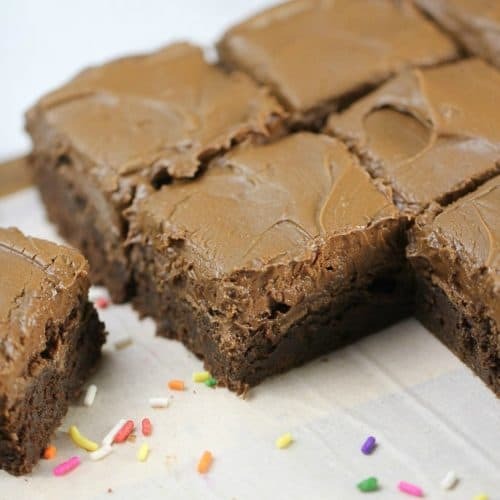 Use a sharp chef's knife to cut the brownies into 16 or 25 squares. Milk can be substituted for cream. How you doooooin? Want some more sinful chocolate and caramel bitefuls? These look scrumptious! Can’t wait to try them and the other treats on this site. Gail they are scrumptious! I can attest! I am so glad you are gonna hang around and check it out. 🙂 Awesome! Thank you Joanne! 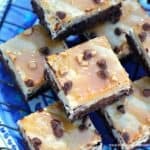 They were one of my family’s favorite brownies. 🙂 Hope you get to try them! 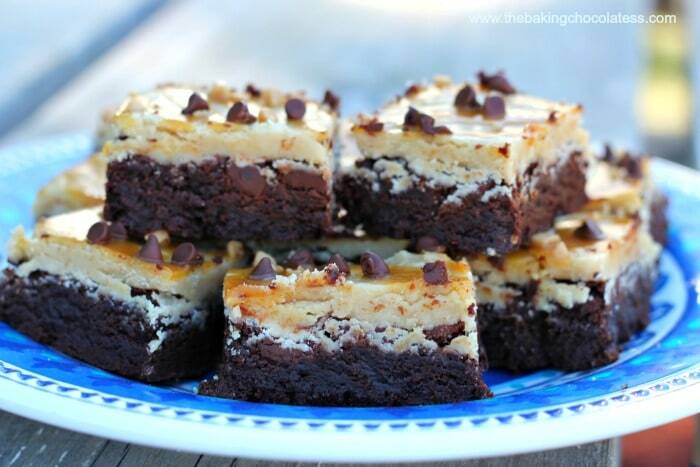 The pictures make these brownies look amazing, yum!